Published: June 8, 2018 at 12:25 p.m. The 18 for '18 series continues with a look at the fastest players in college football for the upcoming season. Of course, the distinction of who is fastest of all can be a never-ending argument circling around various forms of criteria. Our pick for the fastest player last year -- LSU CB Donte Jackson -- acquitted himself well at the 2018 NFL Scouting Combine, where his 4.32-second clocking in the 40-yard dash tied him for the best time of the event. To compile this year's group of speedsters, we considered a variety of factors, including results from track and field events and unofficial 40-yard dash times. This holds true from the grammar-school playground all the way to the AAC: When you're a 155-pound running back, you'd better be fast. 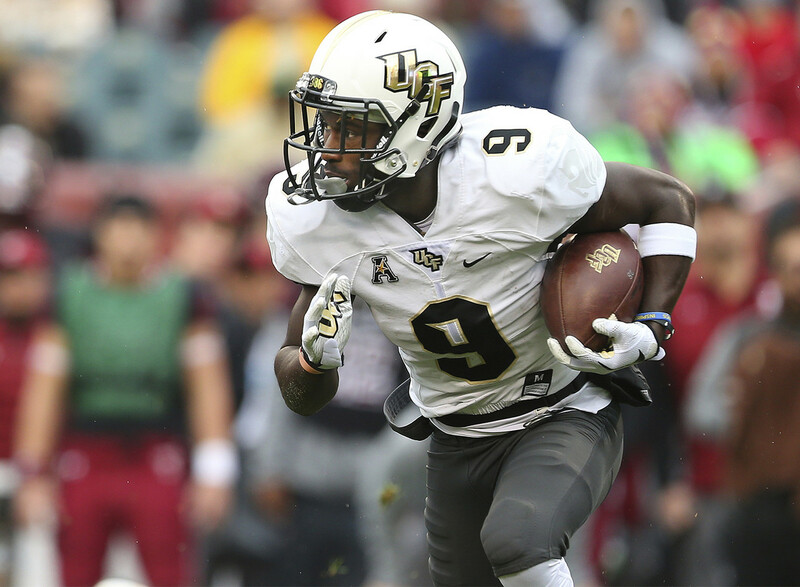 Killins won't scare anyone with his size, but he's a 5-foot-8 blur in the UCF offense. The Knights have clocked him as fast as 4.39 seconds in the 40-yard dash, and it definitely shows on the field. Killins ran for 790 yards on just 122 carries last year (UCF record 6.47 yards per carry), and broke a 96-yard TD against Memphis. Nevada has clocked its freshman All-American at 4.35 seconds in the 40-yard dash, and that speed certainly showed up on the field in his first college season. Mannix's 57 receptions tied for second among all FBS freshmen. As a high school track star, he recorded a 10.81 in the 100 meters, and was a member of a Texas state champion 4x100 relay team at Midland High School in 2015. We've not seen Lingard, a true freshman, on the field yet, but with his speed, it's just a matter of time before he jets past defenders. A five-star recruit from Orange City, Florida, Lingard enrolled at UM for the spring semester and wasted no time establishing himself as the fastest man on the roster. He was clocked at 4.27 seconds in the 40-yard dash in team testing, then joined the UM track squad after spring football practice and was installed as the anchor leg on the Hurricanes' 4x100 relay team for the National Relay Championships. In high school, he was a Florida state champion in the 110-meter hurdles event with a personal best time of 13.94 seconds. Burt makes his third consecutive appearance as one of our fastest players after running a personal-best 13.46 seconds in the 110-meter hurdles at the NCAA Championships in Eugene, Oregon, on June 6, qualifying him for NCAA Finals competition in the event. He finished first in the Big 12 Championships with a wind-aided 13.56 in May. He's clocked a 6.94 time this year in the 60, and a 10.72 in the 100. On the field, Burt caught just 11 passes last year but unsurprisingly led UT receivers in yards per catch (16.1). We didn't hear from the Trojans' fastest player on the football field last year, as he took a redshirt to assist in his transition from running back to cornerback. The payoff should come this fall as Davis brings track-proven speed to the USC secondary. Although he didn't run track this year, he's been clocked at 10.47 seconds in the 100 meters and holds the USC freshman indoor record with a 6.78-second time in the 60. The cousin of Stanford star RB Bryce Love, who's also on this list, certainly got the same family speed gene that Love did. ECU has clocked Canady at 4.35 seconds in the 40-yard dash, and in track, he runs the anchor leg of the Pirates' 4x100 relay team. The ECU coaching staff played Canady at cornerback last year, but gave him a look at running back in the spring. It remains to be seen if he stays in the Pirates' backfield, but either way, the sophomore's wheels will be a big asset. The undisputed deep threat in the Tigers' passing attack has been clocked at 4.35 seconds in the 40-yard dash, and as a high school track star, he clocked a 10.53-second 100-meter time despite a groin pull. He stretched the field for 22.2 yards per catch last season, which ranked fifth in the nation. Auburn will need him to be a more complete receiver this fall, but when it's time to take the top off the defense, he'll again be QB Jarrett Stidham's main target. Cal's blazing-fast receiver never got his 2017 campaign off the ground, succumbing to a season-ending injury after just two games. But expect nothing short of Robertson's best wheels back at Cal this fall; he ran a 4.35-second 40-yard dash this spring and figures to be a key figure in the Bears' receiving corps in 2018. Prior to the injury, he also ran track at Cal and was timed at 10.77 seconds in the 100 meters (2017). Brown replaced Dede Westbrook as the Sooners' most explosive wide receiver last year in fabulous fashion, producing 19.2 yards per catch (57 for 1,095) in his first year at OU as a junior-college signee. Nicknamed "Hollywood" (he's from Hollywood, Florida. ), Brown has been clocked at 4.33 seconds in the 40-yard dash. Consider the comments of former Oklahoma QB Baker Mayfield, who told the Associated Press last year: "I think we saw somewhat with what Dede could do last year with that speed that he had, but I think Marquise is even faster. I love Dede, but Marquise, he's got another gear." Gary Patterson has brought his share of burners to TCU, and Reagor can compete with any of them. His 4.32-second 40-yard dash is the best current time in the program. Last year, he passed on the chance for January enrollment at TCU in order to compete in track as a high school senior. But he didn't need the advantage of spring practice to make an impact as a freshman. Reagor was selected the Big 12's co-Offensive Freshman of the Year after leading the team in receiving yards (576) and touchdowns (8, which was the most by any true freshman in the nation). Track speed and football speed are very different things, and while Love doesn't participate on the Stanford track squad, his football speed is unquestioned. With an FBS-record 11 straight games with a rush of 50-plus yards to his credit, he's a breakaway threat at any spot on the field. He ran a 4.30 40-yard dash at the high school level and as a youngster, Love set national records with USA Track and Field in the 100 meters (11.64 seconds in 11-12 age group, 10.73 seconds in the 13-14 age group) and other events. Stanford, in fact, touted Love's speed with a Heisman promotion on social media last October. Could Gladney beat Stanford's Bryce Love in a 40-yard dash? We'd love to line them up for one, but in terms of football speed, the nod must go to Gladney after the Horned Frogs junior ran the Cardinal RB down from behind, without the benefit of a pursuit angle, on a breakaway run in the Alamo Bowl last year (third play in this clip). TCU has clocked Gladney as low as 4.34 seconds in the 40-yard dash. He also made an outstanding pick against Texas Tech last year, which he returned 94 yards for a score. Auburn's fastest player is quickly becoming among its most valuable, as well. Davis is expected to start at nickelback this fall. He can run the 40-yard dash in less than 4.3 seconds, including a 4.24 to lead the AU roster in 2017 spring testing. He's been hand-timed at less than 4.2, but you don't need to buy into hand-timing legends to recognize Davis as fleet-elite. Sims makes his fourth consecutive appearance in the series with personal bests that include a 10.41-second 100-meter dash and a 6.81 60 for the Stanford track squad. While it's common for college football/track athletes to ditch track and focus only on football after a season or two, Brandt-Sims has maintained his place on both rosters for his entire career; he'll be a fifth-year senior this fall. At the 2018 Big Meet between Stanford and Cal in April, he turned in first-place finishes in three events (100, 200 4x100 relay). On the gridiron, Brandt-Sims has been a reserve throughout his career. The Fighting Irish cover man turned in a personal-best 6.73 seconds in the 60-meter dash in February at the ACC Indoor Track and Field Championships. He posted personal bests in both the 100 meters (10.50) and 200 (21.16) at the ACC Outdoor Championships in May, as well. The Fighting Irish Twitter feed put a 4.38 40-yard dash by Pride on display last month. Meanwhile, the junior's contribution on the football field continues to progress. Last season, he made 22 tackles and his first career interception against the Naval Academy. The Zip can zip. Smith, a track standout at Akron, clocked a 6.72-second 60-meter dash (third place in the 2018 Kentucky Invitational). In May, he finished second in the 100 at the MAC Outdoor Championships with a wind-aided 10.29. He initially signed with Missouri, but transferred to Akron after one year and has found a home on the football field as well (34 catches for 726 yards in 2017). His 21.35 yards per catch last season ranked ninth in the FBS. Brooks-James emerged in 2016 as an effective rusher for the Ducks when Royce Freeman's season was slowed by injuries, and ended up with 771 yards on 101 carries for a whopping 7.7-yard average. He did it with speed good enough to clock personal bests of 10.50 seconds in the 100 meters and 6.71 in the 60 as a freshman for the Ducks track squad. Last year, Oregon's GPS tracking system recorded Brooks-James as fast as 22 mph, and not on a track or even in practice -- that was in game action. And that's a tick faster than some of the swiftest players in the NFL. The Buckeyes' two-sport star is next in line among the parade of NFL draft prospects from the Ohio State DB room. But on the track, he's fearsome as well. Sheffield broke OSU's 60-meter dash indoor record earlier this year with a time of 6.663 seconds. That's the fastest 60 time of any player listed here. The former Alabama player, who had a one-year stop in junior college in between, broke up nine passes last season. That was the second-most on the team to Denzel Ward, who was selected fourth overall by the Cleveland Browns in this year's draft. Word from the OSU staff is that Sheffield is every bit as fast as Ward, who tied for the fastest 40-yard-dash time (4.32) of anyone at the NFL Scouting Combine this year.